The instrumental album DROKK: Music Inspired By Mega-City One came out last week. The work of Geoff Barrow (best known as a core member of Portishead) and the film composer Ben Salisbury, it's a tribute to the synthesizer-based movie soundtracks of the Blade Runner era, as well as to the setting of Judge Dredd, the cult-favorite future-cop serial that's been running weekly in the British anthology 2000 AD for 35 years now. (In the slang of Dredd's world, "drokk" means, roughly, "goddamn it!") There is, of course, a Dredd movie coming out this fall, but DROKK isn't quite its soundtrack -- although it started out that way. We spoke to Barrow and Salisbury about the project, and about their connection to 2000 AD and Judge Dredd. COMICS ALLIANCE: What were the origins of DROKK? GEOFF BARROW: Ben Salisbury and I have known each other for years as... terrible sportsmen, really, playing in the same soccer team, and we would chat about the possibility of working together on something. I was approached by a friend who introduced me to Alex Garland, the screenwriter of Dredd. In the very early stages, Ben and I worked on it, and that's when our involvement in the film stopped -- I can't really go into it any further. But it was a really enjoyable experience, and as a 2000 AD reader from a very early age, I thought "we've got this material, we really like it, let's put a record out." It seemed absolutely fitting to say that it was inspired by Mega-City One, 'cause that's what it was. BEN SALISBURY: We made it almost entirely on these old analog synths that we both have, the Oberheim from 1975. Normally, I work with big orchestras, but Geoff said "we've got to be pure and raw and heavy with this." Now that I've read some 2000 AD, I understand why he was so strict. What I find interesting is that the music has a sort of history -- it's obviously influenced by the late '70s and early '80s sci-fi soundtracks that we both love. There are a lot of weird things going on with time in 2000 AD: it's a future setting, but there's a lot of satire of the past. I read the Judge Dredd book Muzak Killer -- it's all references to '80s pop, but set a hundred years in the future. The sort of nostalgic but futuristic music we were doing seemed to make sense, really. CA: And it's using an instrument that was the sound of the future 35 years ago! You also used some time-stretched instruments -- one of the very first Judge Dredd stories mentions a time-stretcher, actually. SALISBURY: That was just to get another sort of sound palette into the mix. They're all acoustic instruments. I'd come up with a bed for a time-stretched performance on a hammer dulcimer or some strings or something, and then try to record a top line by playing something amazingly fast, as fast as I could. CA: What's your personal history with 2000 AD? BARROW: It was incredibly important for me, really. I suffer from dyslexia, so it kind of bridged the gap -- it really helped. I grew up reading Topper and a few of the war comics like Valiant and Victor. My grandmother worked in a newsagent's, and when she brought back a 2000 AD, I was completely absorbed from then on. That was around 1982. It would have had Judge Dredd, Tharg's Future Shocks, Strontium Dog, Rogue Trooper, and I also remember Ace Trucking Co. and The Ballad of Halo Jones. I was really into the "Cursed Earth" stuff. I'd bring the new 2000 AD home and draw my own copy of it. It was always my dream to be a comic book artist. I kept a keen eye on anything I saw that was Dredd-related -- it even got me into a bit of Batman. I continued up until, I would imagine, I got into a serious relationship. Over the years, I would pick up the odd graphic novel. But I actually find it quite difficult if stories become too involved -- my reading is just not good enough. I never understood what the hell was going on in Nemesis the Warlock. CA: I don't know if anyone did. A lot of the track titles on DROKK are references to bits of Dredd history -- "Council of Five," "Titan Bound," "2T(fru)T." Who came up with them? BARROW: I worked very closely with my best friend on them -- he's an album art designer named Marc Bessant. He's a complete nut. We'd ride skateboards together as kids, discussing who was going to play Dredd in the film. It was always going to be Clint Eastwood, obviously! CA: Do you have any favorite Judge Dredd storylines? BARROW: I think "Democracy." You know, that whole thing about the antihero, and reading about Dredd and how hard he is -- if you live your life in a fairly law-abiding way, you want Dredd to exist. But "Democracy" is just so extreme, and it really gets to the character and what he believes in. All these years I thought he was really cool, and it was the most shocking thing to me. SALISBURY: I've only got a small knowledge of 2000 AD, but I can see why people really got into it. It's very interesting to have this hero character who... is he a good guy? is he a bad guy? I've got stacks of Geoff's comics now. What's the Judge Dredd story I just read? "America!" That was amazing! 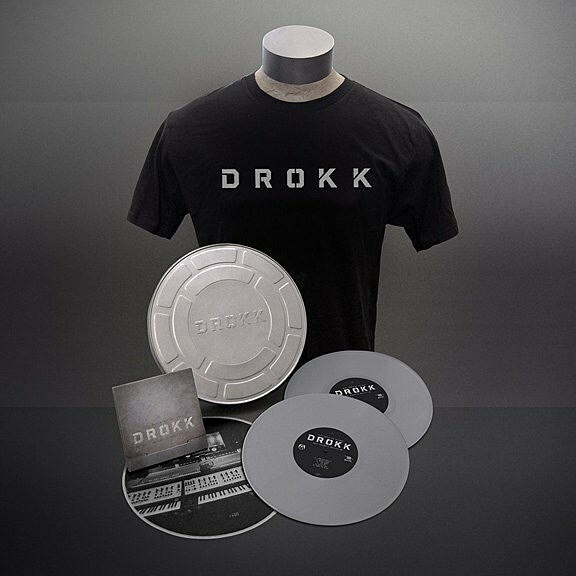 DROKK: Music Inspired by Mega-City One is available now via digital download as well as a variety of physical formats, including a metal film canister vinyl records, a t-shirt and a limited edition print.